It’s no secret—I am a humor nerd. At 8, my first class presentation was on one of Hollywood’s first comic stuntmen, Harold Lloyd! As a marketer, storyteller and performing improviser, I love anything that makes me think and laugh. That’s why I love cartoons so much. We all do. If you’re human, anyway! 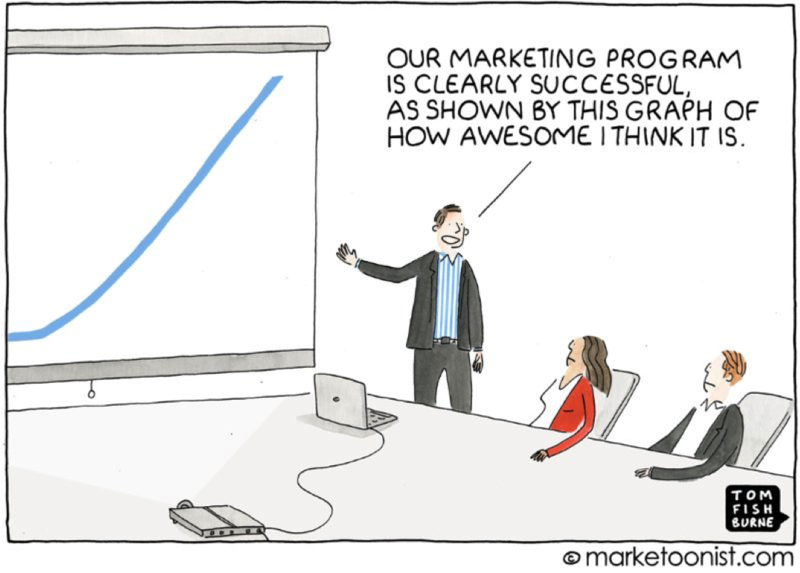 Cartoons teach us so many great things about content, marketing, and connecting with audiences. Over the years, I have had the pleasure of chatting with and interviewing cartoonists, including my friend Liza Donnelly of the The New Yorker, about the craft of cartooning and what all marketers can learn from cartoons (watch her great TED Talk here). That’s the goal behind content marketing: connecting and inspiring action, whether it’s word of mouth, sharing great content, or converting to a sale. If you want your audience to open their wallets; you must first open up meaningful connections with them. Content that connects contains truth. Humor is about the emotional truth–not facts, not data. Cartoons communicate a single big a-ha in an economy of words—with a headline (caption) and a powerful visual element. If you had one big idea for your content, what would it be? Just as cartoonists think through their ‘punchline,’ marketers need to convey a single big, bold, human headline. And talking about products isn’t contagious. Start with a challenge or issue that your audience cares about—the big human issue. Imagine you only had one sentence to communicate, what would it be? That should be your content focus. Audiences often decide what to read based on a powerful, truthful headline. Make it count! The truth is always simple. And the truth is funny precisely because it is relatable. No content has ever been made better by making it more complex. The only antidote to complexity is simplicity, and simple facilitates word of mouth. Great cartoons rely on a great visual (or visuals if it’s a panel of drawings) to communicate a non-verbally. Today, marketers have to be masterful visual communicators. If people only scan visuals in your content, what “message” would they get? What do those visuals say? A great visual (cartoon, infographic, image, etc.) is its own big story. Cartoons aren’t about tickling the logic brain. Cartoons aim for the emotional core. Great content, too, is about making people laugh, making them angry, making them connect. Making them think is good, but making them feel is better. Feelings—not thoughts—move people to action such as sharing. Cartoonists don’t create for everyone. They know their audience well—their likes, dislikes, challenges, etc. Great content works because it’s focused. Choose your most important audience and focus on what it needs. What does your ideal audience think about most? Your enthusiast customer is your best customer—that base is usually the one that cares enough to carry your message and advocate for you. If they don’t see themselves reflected in that message, you’ve aimed too wide. Cartoons have personality: funny, sarcastic, dry wit, whatever. Content reflects the beliefs and values of the creator and the audience being serenaded. Content without personality and a soul isn’t human, and there is simply too much out there competing with your audience for time and attention. Content with a voice speaks loudly and attracts your ideal audience—the people who believe what you believe. Your secret sauce is your voice. Be soulful; be human. 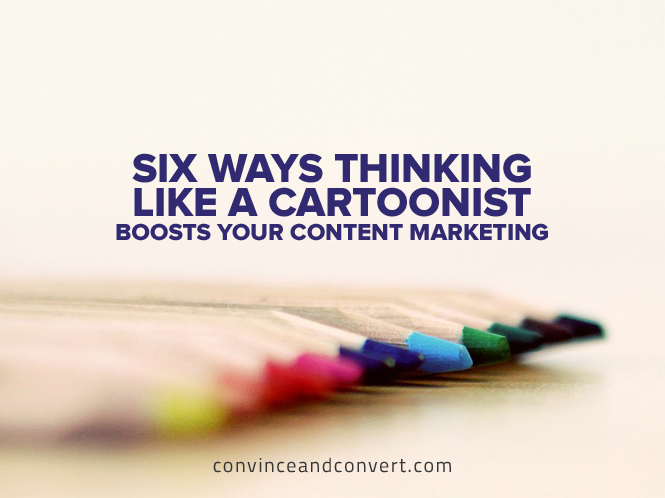 What do you think cartoons teach marketers? Let me know in the comments.